It came out at the weekend and I was busy with piling up empty beer bottles, so I'm a bit late coming to this, but it is here now and you'll like it. Themes for Joomla are a bit different these days. They started out as a few images and a lot of focus on module positions and design. These days, it's about functionality, added extensions and the wow factor. Shape 5 have added all those this month. Basically, if you have a site with lots of videos then this one is for you. 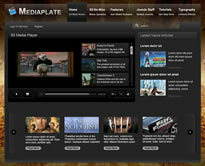 They've called it Mediaplate and what they are trying to do with that is say, all your media, served on a plate. There really is very little to do when you download this theme. To make it all super easy too, Shape 5 have released a new module, S5 Media Player, which allows you to place up to 30 clips. But and as usual, it's not for me to tell you everything you need to know, you just have to click here for more information or a demo and read below for some of the features.